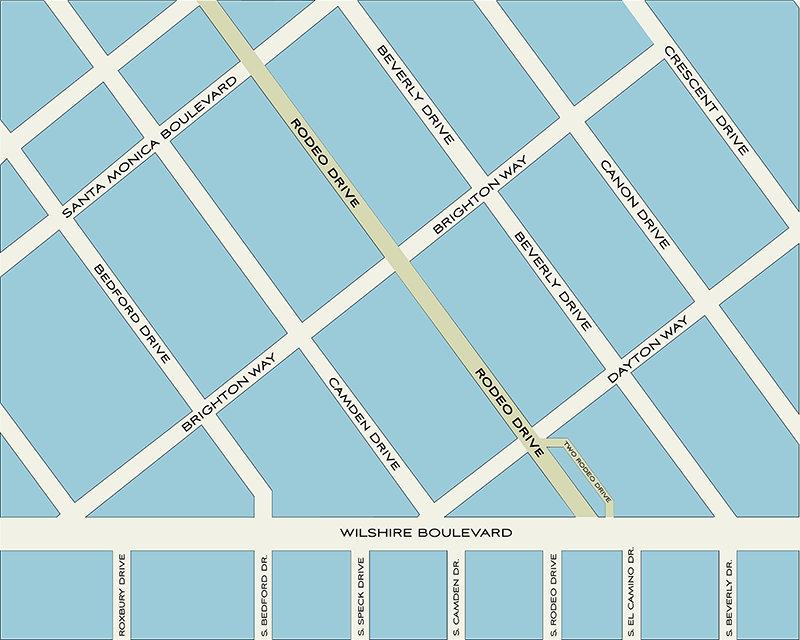 Rodeo Drive shopping area begins at Wilshire Boulevard and ends at Santa Monica Boulevard, and encompasses parallel and side streets such as Beverly Drive, Brighton Way and Dayton Way. Rodeo Drive Shopping District is 3 blocks linearly although Rodeo Drive, the street, is approximately 2 miles long. Click the link below to open a PDF that is printable. This can be a little confusing as they are both referring to "Rodeo Drive". TWO RODEO DRIVE is the upper part that veers a bit crooked at Rodeo Drive and Brighton Way. The upper portion is also called Via Rodeo. Originally inhabited by Native Americans - the Tongva of Gabrielinos, this area and Beverly Hills went through a lot of transitions before becoming a glitzy shopping area and glamorous place of Silver Screen Stars. The Tongva considered it a sacred site, naming it the Gathering of the waters or, in Spanish El Rodeo de las Agua. The name came from a precious commodity in these areas - water - which flowed down the hills into streams from canyons in the hills. When the Europeans arrived much of this area turned over between ranchers until in 1906 Burton Green along with other investors buys the land on the former Rancho Rodeo de las Aguas. 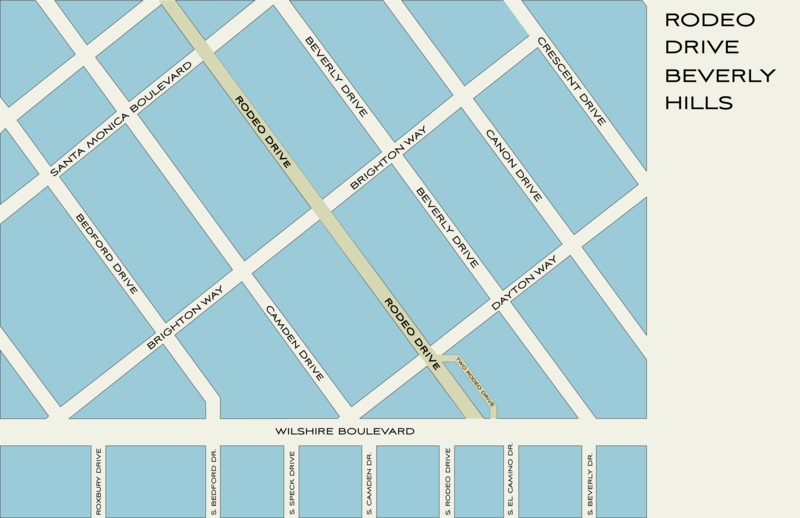 The land will later become Beverly Hills and the city's main street is named RODEO DRIVE. From 1906 to approximately 1967 Rodeo Drive was a fairly quiet street with commerce such as beauty shops, bookstores and hardware stores and later some clothing stores. The first sign of glitz came with the Giorgio Beverly Hills boutique founded by Fred Hayman. It becomes the first high-fashion luxury boutique with its iconic yellow and white striped awning. Customers were known to sip cocktails while shopping or have their purchases delivered to their homes by a courier in a Rolls-Royce. In 1969 Parisian jeweler Van Cleef & Arpels opens their flagship jewelry store. Known in Europe as the jeweler commissioned by royals and noted well-heeled dignitaries, Van Cleef & Arpels still today has their flagship store on Rodeo Drive. From that point on, Rodeo Drive would see notable high-end shops begin to line Rodeo Drive, such as Vidal Sassoon and the street becomes well trodden by Hollywood's elite. In 1983, The Rodeo Collection shopping complex opens and in 1989 the European-style shopping street Two Rodeo Drive opens. From "Scruples to "Pretty Woman"
Rodeo Drive was featured in the novel "Scruples" by Judith Krantz. The novel is a smash hit and in 1980 Warner Brothers produce a television miniseries based on the book. From that point on Rodeo Drive has been featured and made even more famous world round by films such as, "Body Double", Beverly Hills Cop", "Pretty Woman".